Today in forex news the Bank of England interest rate was cut, dropping interest rates from 0.50% to 0.25%. The Monetary Policy Committee left the door open to more cuts going forward. The cut was widely anticipated in this post Brexit business environment. So today, August 4, 2016 is the first Bank of England rate cut in 7 years. For forex traders, Bank of England interest rate news can cause strong movements and formation of new market trends of the British Pound against the other major currencies we follow. The British Pound dropped strong against all 7 currencies we follow after the news today. The GBP/USD is at an intra-day low of 1.8240 and the GBP/NZD had an intra-day low of 1.7750. Most GBP pairs we follow remain inside ranges and clusters, but the GBP/NZD and GBP/JPY have broken short term support levels. 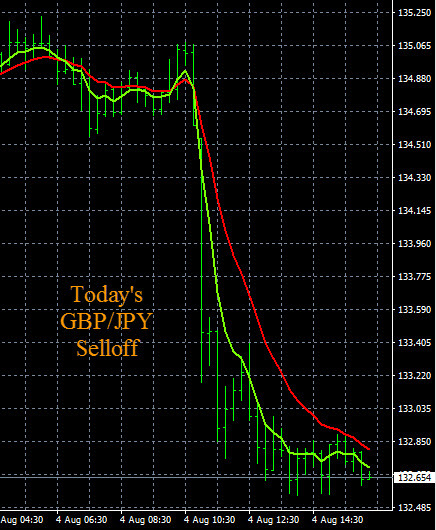 A chart of the GBP/JPY is shown below illustrating the the intra-day price movement of over 200 pips. We expect more GBP pairs to follow and form trends based on GBP weakness. The long term trends on the MN time frame on all of the GBP pairs continues to show GBP weakness. Today’s live sell signals from The Forex Heatmap® are shown below to show the GBP sell off, along with the price chart movement after the Bank of England news announcement today. We will look to continue planning to sell these pairs in our daily trading plans, as the trends are now in place. 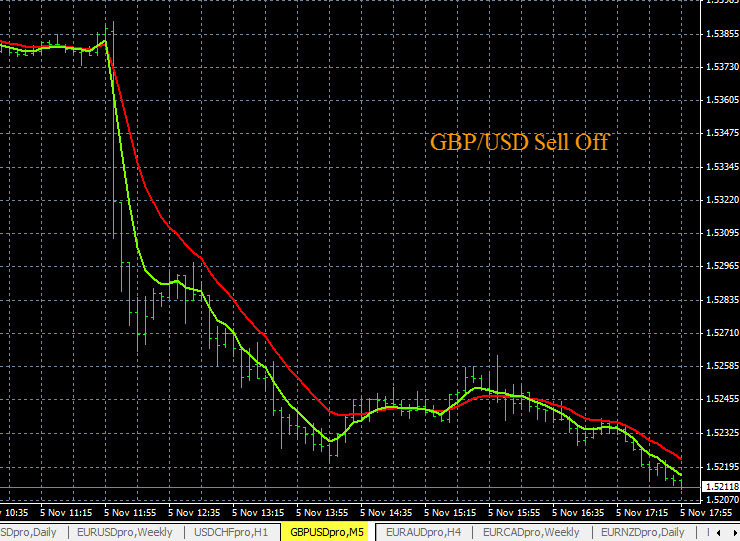 Forex news drivers like like the Bank Of England interest rate decisions can be profitable events for forex traders. 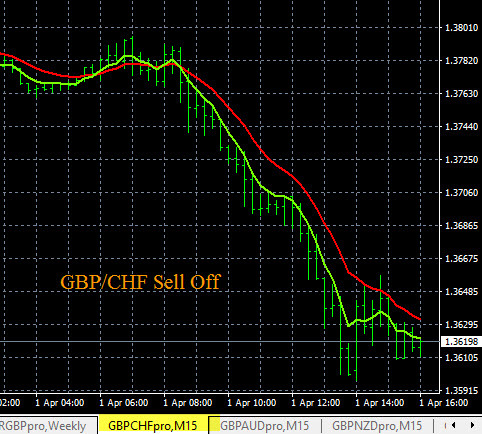 If traders have the proper trading system, signal system and know the direction of the trends on the GBP pairs, they can successfully trade forex news in the direction of the trend. Today after the non-farm payrolls news, the CAD (Canadian Dollar) strengthened on all pairs.The CAD/JPY continued upward in it’s current uptrend and has no resistance nearby, we would continue to hold this pair. The CAD/CHF broke through some resistance, the next resistance area on this pair is around 0.8500, we would scale out lots as it trends higher and approaches this next resistance point. The AUD/CAD also had a very strong downward movement based on the CAD strength. The indicator you see below is The Forex Heatmap®, it provides forex traders with easy to read buy and sell signals. The heatmap works well after any forex news driver like non-farm payrolls, to help traders detect more accurate forex trade entries. Non-farm payrolls can generate movement on many currencies, not just the US Dollar. It is not unusual for another currency group besides the US Dollar pairs to move after the non-farm payrolls news drivers. Today in forex news the CAD (Canadian Dollar) Consumer Price Index (CPI) was announced. The CPI rose 2.3% in the 12 months to May, following a 2.0% increase in April. After the CPI news the CAD strengthened on all pairs. Pairs like the CAD/CHF and CAD/JPY moved higher, since both pairs are trending up they should continue higher next week. We will look to set more trading plans on both pairs next week. The live trading signals you see below indicating the CAD strength are from The Forex Heatmap®, which provides buy and sell signals for 28 pairs. This trading system works to provide forex traders with live trading signals after forex news drivers like Canadian CPI.